"Technology won't replace teachers, but teachers who use technology will probably replace teachers who don't"
I am a technology addict. As I type this on my Chromebook, my iPhone, iPad, and Toshiba laptop are not too far from my fingertips. I have prbably spent more money on personal technology than I have spent on clothing. I like to be able manipulate and explore things; technology allows me to do that on a grander scale. More so than my own enjoyment of technology, I love to pair this with another of my passions: teaching. First and foremost, I do not integrate technology simply for the sake of integrating technology. I do it in a purposeful manner: either to extend and enhance learning (such as with the Green Screen Skits) or to teach them real-world skills. I believe that for students to be able to be successful in life they must be able to effectively and efficiently utilize tech. Many students are good with technology, but we must make an effort to extend this past being able to get a high score on Angry Birds. The absolute powerhouse to my technology integration efforts has been Google Apps for Education (GAFE.) In the fall, I was selected as one of six educators who effectively use technology in their classroom to be a part of a Google Educator Consortium. I earned my Google Certified Educator before anyone else in my cohort and even presented to the entire consortium. My work with teachers and tech will form the basis of a blog post later in the summer. Last year, I used Edmodo as my learning management system. This year, I was lucky enough to use Google Classroom, and it has revolutionized everything. I will post a document for students to edit and see them collaborate in real time. When we were working on our "We Didn't Start Virginia" music video, I posted a Doc with everything we needed pictures of and told them to find the links. I gave a brief mini-lesson on ctrl+c and ctrl+v to copy/paste, which is a critical time saving tip for students to have. Finding all 75+ pictures and pasting the links would have taken me over an hour. With the students working together, it took less than fifteen minutes. Similarly, students can collaborate on writing documents together. They have figured out how to share it with each other (surprisingly with minimal instruction from me.) They use the chat box to communicate (sometimes getting into emoji battles!) I like to preface collaborating on a Doc by saying that every keystroke is logged and I can see everything they do. We have all of their Docs set up in a folder that has been shared to me, so I have executive oversight on everyone and their work. Yesterday, we were working on our final writing assignment: a letter to our future selves. The assignment wasn't so much based on the topic, but more based on editing. My students struggle with self-editing. They often believe that "once and done" is enough. We have usually done the traditional paper rough draft and typed final copy, with very little change between the two. I wanted to have a way to effectively track these changes and hold students accountable. Through Chris Nesi's (@mrnesi) House of EdTech Podcast, I found a really cool Google Chrome Extension called Draftback. It takes all of the revision history and plays it into a video so you can track edits and changes. I wrote a letter to myself to model the writing process and played the Draftback for the students. So far, I have seen the students taking their time and working to really enhance their writing, because they know that I will be checking their Draftback. 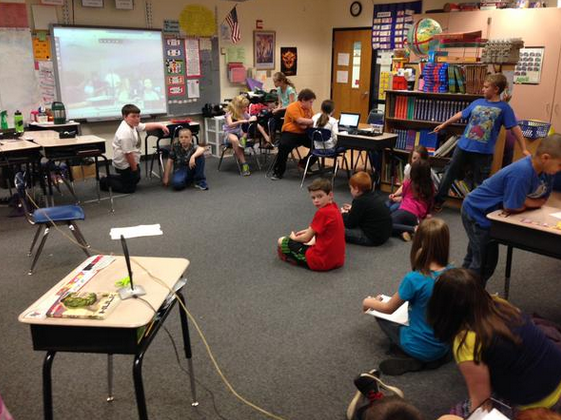 In addition to using Google Apps and Documents, our class also utilized Google Hangouts. We do this in two primary ways: Mystery Person/Place or Weekend/Snowday Hangouts. Mystery Skype is all the rage, but I did not really understand what it was. After connecting with Richard Hattal (@hattals) during a Twitter chat, we decided to have our classes collaborate on Reconstruction differences in Florida and Virginia. We had a nice discussion and decided we wanted to continue our partnership. We extended this into Mystery Person, which was essentially a version of the game Guess Who played with famous Floridians and Virginians. We have done two of them, with his class winning once and mine winning once. I hope to continue this in the future. We also were lucky enough to connect with Kayla Delzer's (@mrsdelz) class to do a Mystery Place Hangout. Even though it was different than what we were used to (different format and different topic,) we were successfully able to locate her class! Google Hangouts continue on Snowdays and Weekends as well, which was also discussed in a previous blog post. This is an optional practice that I started this year. Students join me on weekends and snowdays to extend their learning in math or Virginia Studies. It is a good way to show them that learning doesn't stop when you leave my classroom. Students have asked if I would continue over the summer. How could I say no?! Technology has the ability to be a force for change and empowerment of students, if used properly. This is merely a sampling of some ways technology pokes its head out in my classroom. 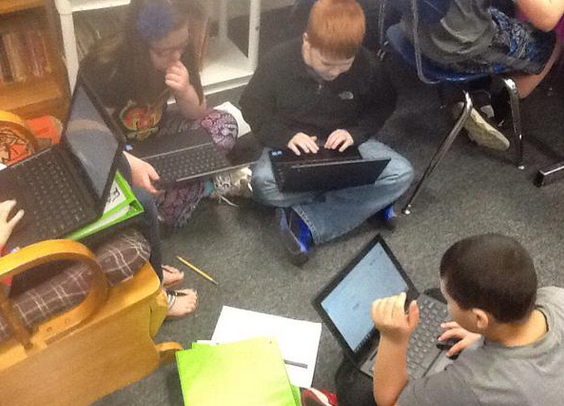 Many students who are not great with reading or math have emerged as leaders in technology in my classroom. They may be the student who remembers how to do cut and paste better than anyone, the student who can log others onto Google Drive in a flash, or the student who recently figured out she could use Google as a spell-checker. Technology is changing education, whether people are ready or not. We must embrace it to best serve our students. Without purposefully integrating technology, we are doing a disservice to our students by not preparing them with skills for their future careers and not allowing them to have a rich experience of education. What are your thoughts on technology? How do you integrate it into your classroom? Hey Justin, great post. Really enjoyed reading it, especially the part about learning during weekends and snowdays. It seems you’re a good teacher and students appreciate your work. Thanks for the feedback! I hope to empower all students through technology. It is true, so teachers must update with technology, a smart school is better and loved by students too... Why not teachers use free myly for easy parent teacher communication. Absolutely. We must prepare the students for the now and the future!